Thin layers of yttria-stabilized zirconia (YSZ) at 11 mol% Y2O3 doping level was deposited on a sintered disk of Y2O3 doped ceria electrolyte by spin-coating from an alkoxide solution. Dense sintered films were obtained by heat-treatment at 600°C. Open circuit voltage (OCV) was measured across the disk in a fuel cell mode with hydrogen fuel on the ceria side and pure oxygen on the YSZ side. 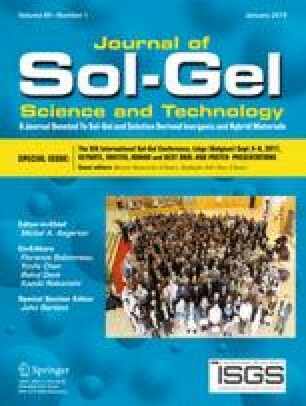 Marked improvement of OCV was obtained on the two-layer electrolyte structure with the sol-gel YSZ film.